When it comes to making your selections for the Grand National the form book goes out of the window. That’s according to the results of the latest Ladbrokes News poll which has revealed that the majority of readers go by the name of a horse to make their choice. It was a fairly close-run contest though with ‘Name’ jumping the last to come out in front with 46 per cent of the vote. Arguably the obvious choice – ‘Form’ – was left trailing in second while the other entrants were left fighting it out amongst themselves to fill the places. 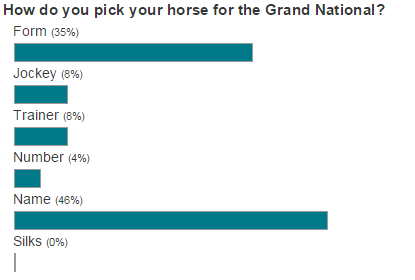 The respective horse’s jockey was not deemed particularly important with only 8 per cent of you plumping for that selection as your reason to pick a Grand National fancy. Meanwhile, the trainer and number of the horse were also deemed not worthy of too much attention. However, a special mention must go to the colour of the silks which failed to attract a single vote! That’s despite the fact that of the last 20 winners some 16 have worn either green or white. Make of that what you will! Good luck with your bets on the big day and head over here to get the latest odds.